Jalandhar: On the valedictory day of AIU’s North Zone Vice chancellors Meet at Lovely Professional University, all the Vice Chancellors, Directors & Delegates, resolved to work together to make Northern India a hub of Higher Education. Making many other related resolutions, they got strong-minded to shape maximum of zonal universities to have coveted place among top 200 universities of the world. Commencing the second & final day of the conference with third technical session for Academia Industry Interface, VCs shared their thoughts unanimously to have more and more engagement of educational institutes with industries. They held that it is strongly needed so that renowned companies might visit and interact with the students to let them become globally competent professionals. VCs also discussed about the key role of industry in curricula development, consultancy and research. In the last and the fourth session detailed discussion was held among VCs for globalization of education. 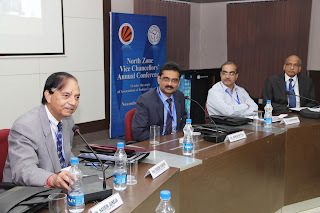 The two-day conference of AIUs North Zone VCs was organized at LPU on 23 -24 Nov 2012, which provided a platform to Vice-Chancellors to discuss significant issues of higher education and problems being faced by them. The conference was attended by 36 VCs belonging to the varsities located in the zone. LPU was specially chosen for this conference, looking at the fast growth of the university, which has been regularly scaling on international parameters requisite in the realms of education. Illustrative, Prof Abdus Sattar Mohammad, Vice Chancellor North South University Dhaka (Bangla Desh) and Dr Suresh Kumar from IOWA State University, US also participated in the ‘Meet’. Apart from Indian universities, six foreign varsities, including Kathmandu University, Nepal; Royal University of Bhutan, Thimpu; Middle East University, UAE; Open University Malayasia, Malaysia; University of Technology, Mauritius and the Mauritius University are also the associate members of the AIU. Struggling to select some opportunity to write a truly original announcement of purpose would be a frequent mistake made by faculty and graduate school applicants. There's a nice line between creativity and being utterly subjective. Continue reading for more information about finding your ideal balance. read here if you want to know more about the quality writing services. Every week bundle of the games is released but recently war zone game is release which becomes famous all over the world because it is so well to play but you can get readmission help from us . The environment condition of this game is so well and every type of the people can play this game. It is so wonderful game.